The mechanisms by which alpha-2 adrenergic receptors are down-regulated following chronic exposure to agonist are not well understood. Interestingly, the human alpha-2C receptor does not down-regulate, whereas the opossum alpha-2C receptor does down-regulate. A comparison of the amino acid sequence of the third intracellular loop of these two receptors shows that the opossum alpha-2C receptor contains a potential G protein-coupled receptor kinase (GRK)phosphorylation motif (EESSTSE) with four hydroxyl residues, whereas the human alpha-2C receptor motif only contains two hydroxyl residues (DESSAAAAE). Because a similar acidic serine-rich motif (EESSSSD) in the human alpha-2 adrenergic receptor has been demonstrated to be phosphorylated by GRK and all four serines are required for desensitization of the receptor, we sought to determine whether the EESSTSE sequence was involved in the down-regulation of the alpha-2C adrenergic receptor. Site-directed mutagenesis was used to mutate the opossum alpha-2C receptor to SSVA and AAVA in place of the SSTS wild-type sequence. Down-regulation experiments on CHO cells transfected with the receptors demonstrated that neither of the mutated receptors down-regulated following 24 h exposure to norepinephrine, whereas the wild-type receptor down-regulated to 65 ± 10% of the control. These results indicate that a motif with four hydroxyl amino acid residues in an acidic environment is important for down-regulation of the opossum alpha-2C adrenergic receptor. Because these are potential GRK phosphorylation sites, we suggest that GRK phosphorylation may be involved in alpha-2C adrenergic receptor down-regulation. Prolonged or repeated agonist stimulation of G protein-coupled receptors frequently causes a reduction in the response to the agonist . Short-term agonist exposure results in desensitization that is characterized by a rapid (minutes) and reversible uncoupling of the receptor from the G protein followed by sequestration and/or internalization of receptors from the cell surface. Down-regulation occurs after prolonged agonist treatment (hours to days), resulting in a loss of receptor binding sites [2–4]. The processes involved in homologous desensitization have been extensively investigated for the beta-2 adrenergic receptor, which is the prototypical G protein-coupled receptor. Initial uncoupling of the beta-2 receptor from the G protein after agonist binding is mediated by phosphorylation by G protein-coupled receptor kinase (GRK) of specific residues in the carboxyl tail of the receptor. The phosphorylated beta-2 receptor enhances the binding of beta-arrestin, which not only uncouples the receptor from the signal transduction process but also serves as an adapter protein that mediates entry into the internalization pathway , as well as serving as a platform for additional signaling pathways . The mechanisms of beta-2 adrenergic receptor down-regulation appear to involve both an increase in the rate of degradation of the receptor as well as a decrease in the levels of beta receptor mRNA . Down-regulation of the beta-2 receptor is, in part, due to trafficking of the beta-2 receptor to lysosomes via the clathrin-coated pit endosomal pathway [8, 9]. The alpha-2 adrenergic receptors also undergo agonist-induced desensitization and down-regulation. Desensitization occurs both in cell culture systems [10–12] and in the intact animal [13, 14]. In general the mechanisms of desensitization for the alpha-2 adrenergic receptors appear to be similar to those for the beta-2 receptor. There are three subtypes of the alpha-2 adrenergic receptor: alpha-2A; alpha-2B; and alpha-2C . The human alpha-2A subtype undergoes phosphorylation and short-term desensitization [11, 12], whereas the human alpha-2C subtype is not phosphorylated  and does not desensitize . The human alpha-2C subtype, however, does undergo arrestin-dependent internalization . Many studies [11, 18], including those from our laboratory [10, 19, 20], have demonstrated agonist-induced down-regulation of alpha-2 receptors, although much less is known about the specific mechanisms for down-regulation as compared to the beta-2 receptor. In contrast to alpha-2A and alpha-2B adrenergic receptors from several species, the human alpha-2C receptor does not appear to down-regulate in response to agonist treatment in transfected cell culture systems . By contrast, the opossum alpha-2C receptor in the OK cell line does down-regulate in response to norepinephrine [19, 20]. The reason for this difference is the focus of the current studies. 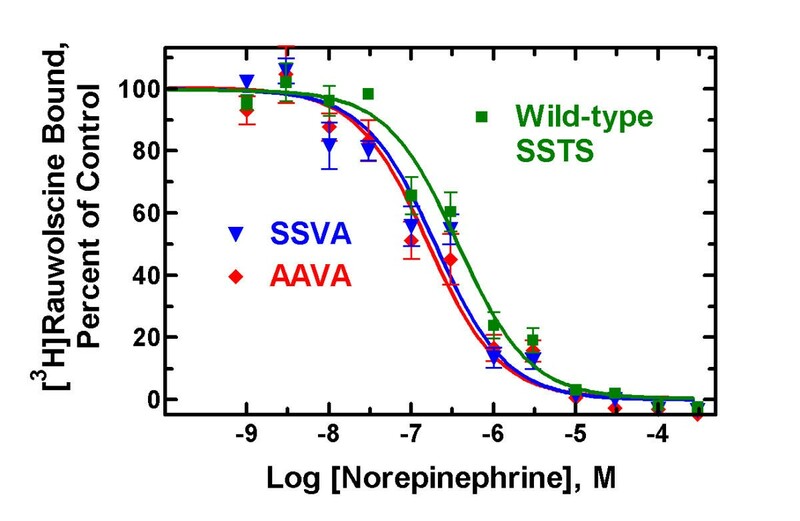 The human alpha-2A adrenergic receptor has an acidic serine-rich motif (EESSSSD) in the third intracellular loop that has been shown to be important in agonist-induced desensitization but not in agonist-induced sequestration/internalization. Site-directed mutagenesis studies indicate that all four of these serines are phosphorylated by GRK, and all four are needed for desensitization . The influence of this motif on down-regulation was not investigated, however. The opossum alpha-2C adrenergic receptor has a very similar acidic serine motif (EESSTSE) in the third intracellular loop (Figure 1; ), whereas the human alpha-2C receptor has a DESSAAAE sequence in the same region (Figure 2; ). 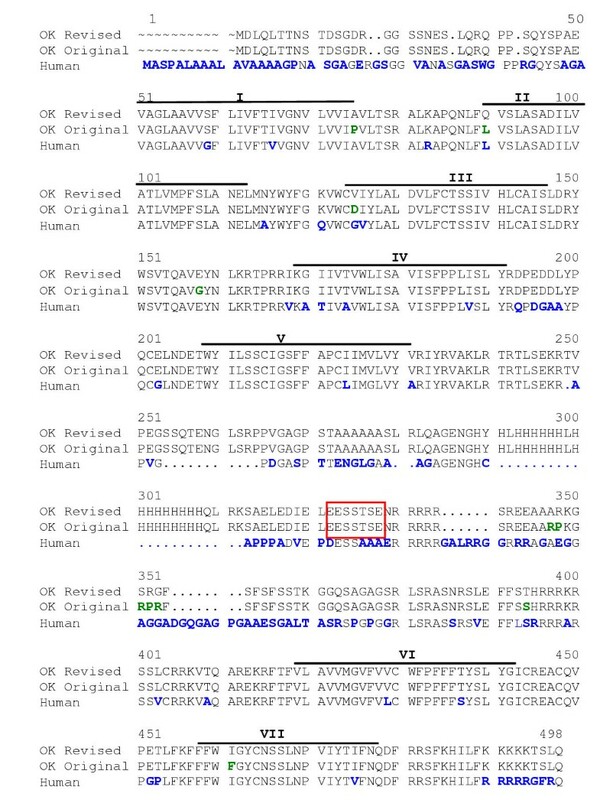 Thus, we postulated that the lack of down-regulation in the human alpha-2C was related to having only two rather than four serines in the motif, and furthermore that the ability of the opossum alpha-2C to undergo down-regulation was dependent on having all four serine/threonine residues in the EESSTSE motif. To test this hypothesis, we mutated the opossum alpha-2C serines and threonine residues to alanines and valine, respectively, and tested whether the expressed receptors would down-regulate. Down-regulation was not observed in the mutated receptors following treatment with norepinephrine for 24 h.
The sequence of the third intracellular loop of the opossum alpha-2C adrenergic receptor. 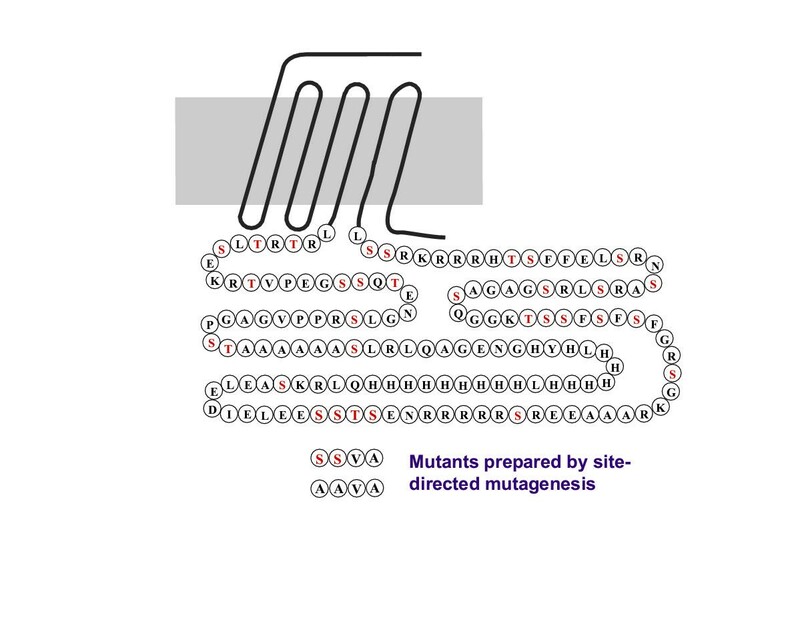 The sequence of the two mutated receptors created by site-directed mutagenesis are indicated. Potential phosphorylation sites (serine and threonine residues) are shown in red. Comparison of the sequences for human and opossum alpha-2 adrenergic receptors. Differences between the original and the revised opossum alpha-2C sequences are shown in green. Differences between the human and the revised opossum alpha-2C sequence are shown in blue. The transmembrane regions are shown as a line over the sequence. The EESSTSE sequence is identified with a box. In the process of confirming the mutations, we also completely re-sequenced the wild-type clone and found several differences from the originally published sequence (GenBank #U04310 ). The corrected sequence differs from the original in 19 bases, which results in 11 amino acid residue changes as detailed in Figure 2. The sequence has been corrected in Genbank. The results of [3H]rauwolscine saturation experiments using the wild-type and mutated receptors from two independent transfections of both mutations are given in Table 1. The Kd values for the two mutants (0.071–0.118 nM) were similar to those of the wild-type (0.113 nM) and similar to the previously reported Kd of 0.056 nM for the wild-type alpha-2 receptor for [3H]rauwolscine in NaPO4 buffer . Inhibition experiments with [3H]rauwolscine indicated that the affinity of norepinephrine for the mutated receptors was approximately two-fold higher (lower Kd value) than for wild-type receptor (Figure 3). Norepinephrine inhibition of [3H]rauwolscine binding. The data points are the means ± SEM of three independent inhibition experiments, each done in duplicate. The concentration of [3H]rauwolscine was 0.12 ± 0.01 pM. The IC50 values determined from these data are 380 nM, 170 nM and 160 nM for the wild-type (SSTS), SSVA and AAVA receptors, respectively. The 100% values were 1223, 755 and 285 cpm for the wild-type (SSTS), SSVA and AAVA mutants, respectively. The means of the Ki values determined in the three individual experiments are given in Table 2. Affinity (Kd) and density (Bmax) of mutated alpha-2C adrenergic receptors expressed in CHO cells. Affinity of norepinephrine for the mutated alpha-2C adrenergic receptors expressed in CHO cells. Ki values were derived based on a single-site model and are the geometric means of three independent inhibition experiments, each done in duplicate. The slope factor was determined in a separate analysis based on a variable slope model. The data were not consistently better fit by a two-site model than a one-site model for any of the three clones. The concentration of [3H]rauwolscine was 0.12 ± 0.01 nM. *Significantly different (p < 0.05) than wild-type based on a t-test of the pKi values. After a 24 h treatment with 0.3 μM norepinephrine, the wild-type receptor down-regulated to 65 ± 10 % of control (p < 0.05; n = 7). 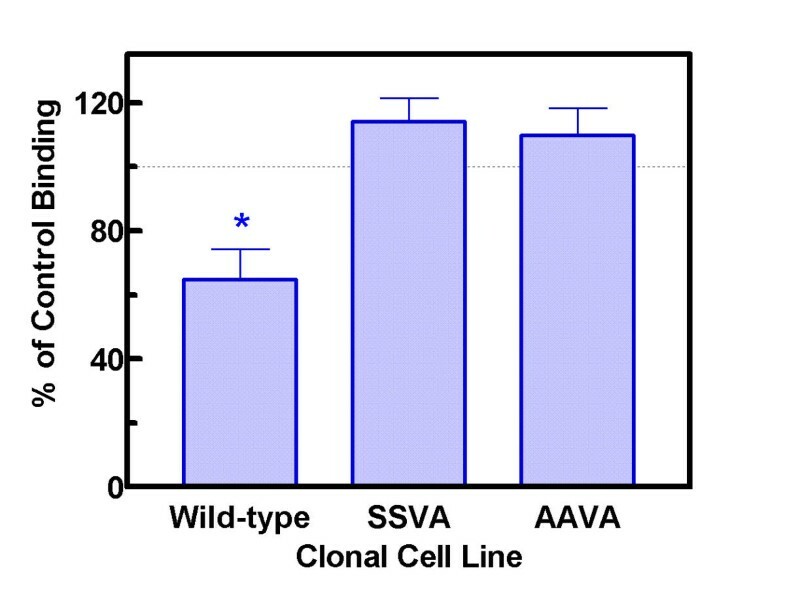 By contrast, no down-regulation was observed with either the SSVA (114 ± 10 % of control) or the AAVA (110 ± 9 % of control) receptors (Figure 4). Effect of 24 h treatment with norepinephrine on binding of [3H]rauwolscine. Cell were incubated with 0.3 μM norepinephrine or vehicle for 24 h and membranes prepared. Specific binding to the alpha-2C adrenergic receptor was determined using 0.40 nM [3H]rauwolscine. The values are mean ± SEM for 7 experiments using two different clones. Each experiment consisted of three culture dishes with norepinephrine and three without norepinephrine for each clone and each dish was assayed in duplicate. The amount of specific binding in the wild-type following the norepinephrine pretreatment was significantly different from the binding in the control by a t-test (p < 0.05). The binding levels of the two mutant clones were not different following norepinephrine pretreatment as compared to control. All three alpha-2 adrenergic receptor subtypes from nearly all species that have been tested undergo agonist-induced down-regulation [24, 25]. Interestingly, we have shown that the potency of norepinephrine to produce down-regulation differs among alpha-2 receptor subtypes [19, 24]. The concentration of norepinephrine required to produce half-maximal down-regulation is approximately 2 μM for the alpha-2A receptor. In contrast, norepinephrine is more potent at down-regulating the alpha-2B and alpha-2C subtypes, with a concentration of only 70 nM required to produce half-maximal down-regulation. This difference in potency appears to be a characteristic of the receptor protein itself, because the cellular environment in which a particular subtype is expressed does not affect the potency of norepinephrine to produce down-regulation. The human alpha-2C receptor is somewhat unique among the alpha-2 receptors in that it does not appear to undergo agonist-induced down-regulation . The human alpha-2A adrenergic receptor, which does undergo down-regulation, has an acidic serine motif (EESSSSD) in the third intracellular loop. Sequentially mutating each of the four serines to alanine decreased the phosphorylation of the receptor by approximately 25% for each serine, and mutating either the first two or the last two serines to alanines prevented agonist-induced desensitization, but not agonist-induced sequestration/internalization . The influence of mutations in this motif on down-regulation has not been investigated. The human alpha-2C receptor, by contrast, has a DESSAAAE sequence in the same region [Figure 2; ]. Thus, it is possible that the lack of desensitization and perhaps also down-regulation of the human alpha-2C receptor is due to the fact that there are only two hydroxyl residues in the DESSAAAE motif rather than the four hydroxyl residues in the alpha-2A EESSSSD motif. The opossum alpha-2C adrenergic receptor has a EESSTSE acidic serine/threonine motif in the third intracellular loop (Figures 1 and 2), which could be a substrate for GRK based on the EESSSSD motif of the alpha-2A subtype. Thus, we postulated that the lack of down-regulation in the human alpha-2C subtype is related to having only two rather than four serines in the motif, and that mutating the threonine and serine residues at the end of the opossum EESSTSE motif to valine and alanine residues to give EESSVAE might prevent down-regulation of the opossum alpha-2C receptor. Consistent with this prediction, treatment with 0.3 μM norepinephrine for 24 h failed to down-regulate the receptor containing the motif mutated to EESSVAE, although the wild-type receptor with the EESSTSE motif was down-regulated by 35%. The inhibition data indicate that the affinity of norepinephrine for the receptors containing the mutations is slightly higher than for the wild-type. The affinity of norepinephrine for the mutated receptor lacking two of the hydroxyl residues was approximately twice as high as the wild-type. The elimination of the remaining two hydroxyl residues did not have any additional effect on the affinity of norepinephrine. These data eliminate the possibility that the lack of down-regulation in cells containing the mutated receptors is a consequence of the mutants having a lower affinity for norepinephrine than the wild-type. The elimination of the terminal two hydroxyl amino acid residues in the EESSTSE motif is sufficient to prevent down-regulation of the opossum alpha-2C adrenergic receptor. Similarly, mutation of only two serine residues in the human alpha-2A receptor resulted in a loss of desensitization . Because the EESSSSE motif in the human alpha-2A receptor is a known GRK substrate, and because eliminating two potential phosphorylation sites prevents down-reguation, phosphorylation of the opossum alpha-2C receptor may be important in the mechanism of down-regulation of this receptor. By contrast, a deletion of twelve residues of the human alpha-2A receptor (293–304) which includes the EESSSSE motif did not appear to prevent agonist-induced down-regulation . Thus a phosphorylation pathway may not be involved in agonist-induced down-regulation of the alpha-2A adrenergic receptor. In addition to the hydroxyl amino acid residues, acidic residues may also be an important sequence element for alpha-2 adrenergic receptor phosphorylation and regulation [27, 28]. The region from 300 to 313 in the opossum alpha-2C receptor, which encompasses the EESSTSE motif, is a high acidic region, with 50% (seven of fourteen) of the residues being acidic amino acids (Figure 2). In an effort to determine if four hydroxyl amino acid residues in an acidic environment might be a common motif for phosphorylation and receptor regulation, we searched the G Protein-Coupled Receptor Database for four consecutive hydroxyl residues (either serine or threonine) in a linear sequence that was at least 1/3 acidic with no basic residues which occurred in either the third intracellular loop or the carboxyl terminal tail. As can be seen from the results in Table 3, this does not appear to be a common motif for G protein-coupled receptors, not even for alpha-2 adrenergic receptors. Indeed, this motif is not found in the alpha-2B subtype which does undergo agonist-induced down-regulation, although as noted above a highly acidic region appears to be important and could be related to the additional negative charge provided by phosphorylation. Thus, it is likely that there are multiple mechanisms that are involved in down-regulation of G protein-coupled receptors. G protein-coupled receptors with four hydroxyl amino acid residues in a acid environment. The G Protein-Coupled Receptor Database http://www.gpcr.org/ was searched for four consecutive hydroxyl amino acid residues (either serine or threonine) in a linear sequence that was at least 1/3 acidic (aspartic or glutamic) with no basic residues (lysine or arginine) and which occurred in either the third intracellular loop or the carboxyl-terminal tail. A motif with four hydroxyl amino acid residues in an acidic environment appears to be important for down-regulation of the alpha-2C adrenergic receptor. The human alpha-2C receptor, which has a DESSAAAE motif with only two hydroxyl residues, does not undergo down-regulation. Modification of the EESSTSE to EESSVAE was sufficient to prevent down-regulation of the opossum alpha-2C adrenergic receptor. Because these are potential GRK phosphorylation sites, our data further suggest that GRK phosphorylation may be involved in down-regulation of the alpha-2C adrenergic receptor. Restriction enzymes were purchased from New England Biolabs (Boston, MA). Norepinephrine and other chemicals were from Sigma (St. Louis, MO). Mutations of the opossum alpha-2C adrenergic receptor cDNA in pRc/CMV vector described previously  was accomplished using the QuickChange™ Site Directed Mutagenesis Kit (Stratagene, LaJolla, CA). The SSTS sequence in the third cytoplasmic loop (amino acid residues 309–312; Figures 1 and 2) was mutated to SSVA using forward and reverse primers with the following sequences (the bases introducing the mutation are underlined), which also introduced a new restriction site: GAACTGGAGGAGAGTAGCGTGGCT GAGAACCGGCGCAGGAGGC and GCCTCCTGCGCCGGTTCTCAGCCAC GCTACTCTCCTCCAGTTC, respectively. To screen for the presence of the mutation, the alpha-2 adrenergic receptor insert was cut from the vector using Hind III (895) and EcoR1 (1841) and cut with Ddel. In a similar manner a further AAVA mutation was prepared from SSVA using GACATCGAACTGGAGGAGGCCGCA GTGGCTGAGAACCGGCGC and GCGCCGGTTCTCAGCCACTGCGGCC TCCTCCAGTTCGATGTC forward and reverse primers, respectively. The presence of the second mutation was determined using the AlwNi. To further confirm the sequence, the entire cDNA for the insert was sequenced for each mutation. CHO-K1 cells (American Type Culture Collection) were maintained in Ham's F-12 medium (GIBCO) with 10% fetal bovine serum (GIBCO 26140-079) in 95 % air/5% CO2 at 37°C in a humid atmosphere. Wild-type and mutated receptors in the pRc/CMW vector were transfected into CHO-K1 cells using calcium phosphate precipitation technique as described previously . Stable transfectants were selected with 500 μg/ml G-418 (Geneticin; Life Technologies) and screened by intact cell binding using [3H]rauwolscine as previously described . The cells were plated at a density of 2 × 105 cells/ml in 150-mm culture dishes with 20 ml of growth media and allowed to grow for four days to near confluence. The medium was replaced with fresh medium lacking G-418. Twenty-four hours later, either 2 μl of 3 mM norepinephrine in 5 mM HCl or just 2 μl of 5 mM HCl (vehicle control) was added to each of the plates. Cells were harvested 24 h after adding norepinephrine or vehicle. The medium was removed and the cells were rinsed with 10 ml of cold phosphate-buffered saline (PBS) containing 5 mM EGTA, pH 7.4. Another 10 ml of PBS was added to the plate and the cells were scraped off the plate using a rubber policeman. The plate was rinsed once with 10 ml of PBS. The scraped cells were centrifuged at 2000 × g for 5 min at 4°C, the supernatant was discarded, and the pellet was stored at -80°C until assayed. We used 300 nM norepinephrine in the down-regulation studies because we have previously shown that this concentration induces maximal down-regulation for the wild-type alpha-2C subtype [20, 24]. Pellets were homogenized in 12 ml of ice-cold 50 mM Tris HCl buffer (pH 8.0) with a Tissumizer (Tekmar, Cincinnati, OH) for 20 sec at 75% of the maximum speed and the suspension was centrifuged at 47,000 × g for 10 min at 4°C. This step was repeated a second time. For saturation experiments, the resulting pellet (a crude particulate membrane fraction) was resuspended in 200 volumes of 25 mM NaPO4 buffer (pH 7.4) and re-homogenized for use in the radioligand binding assay. For down-regulation experiments the cells were re-homogenized in 5 ml of 25 mM NaPO4 buffer (pH 7.4). For saturation experiments, duplicate tubes were prepared containing 970 μl of tissue and 20 μl of [3H]rauwolscine at six concentrations, with final concentrations from approximately 6 pM to 0.6 nM. Nonspecific binding was determined using a final concentration of 200 μM (-)-norepinephrine. For competition experiments, duplicate tubes were prepared containing 970 μl of tissue, 10 μl of norepinephrine at various concentrations, and 20 μl of [3H]rauwolscine (81.5 Ci/mmol, NEN-Dupont, Boston, MA) at a single concentration of 0.12 nM, which is approximately the Kd value. Twelve appropriately spaced concentrations of norepinephrine were used in each competition experiment. The extent of down-regulation was determined using a single concentration of [3H]rauwolscine (0.40 nM; about 3 times the Kd value). We have previously shown that norepinephrine pretreatment does not alter the radioligand Kd of the opossum alpha-2C adrenergic receptor [20, 24], thus making it possible to estimate the receptor density with a single concentration of radioligand. Total binding was determined in triplicate and nonspecific binding in duplicate for each of the three dishes for each condition. All assays were incubated at room temperature for 60 min. Membrane suspensions were filtered through Whatman GF/B glass fiber filters with a 48-sample Brandel cell harvester (Biomedical Research and Development, Gaithersburg, MD). Filters and tubes were washed three times with ice-cold 50 mM Tris HCl buffer (pH 8.0). Radioactivity was determined by liquid scintillation photometry. Protein concentrations were determined using the Bio-Rad Protein Assay (Bio-Rad, CA) based on the Bradford method , with bovine serum albumin as the standard. Bmax (receptor density) and Kd (radioligand affinity) values were determined from the analyses of saturation experiments utilizing nonlinear regression with Prism 3 (GraphPad, San Diego, CA). Bmax and Kd values are given as arithmetic and geometric means, respectively. Competition binding data were also analyzed with Prism 3 to determine the IC50 values based on the single-site model and slope based on the variable slope model. Ki values were calculated from the IC50 values , and are presented as geometric means. The statistical analysis of the down-regulation data was conducted using a two-tailed paired t-test of the mean of the duplicate assays for each dish of cells incubated in the presence of norepinephrine as compared to control cells.